I went short! Well… shoulder length. I cut about 20-25 centimeters of my hair and donated the whole bunch to charity. I’m so happy with the result! For me to cut this much of my hair is a huge change. The last time my hair was this short, I must have been in elementary school. I do have to say though that it’s a change for the better. Ever since I started high school my hair used to be voluminous and curly. You know, the kind of hair that everyone is jealous of and wants to braid. These past two years however I lost a lot of hair. Along with this it went from curly to wavy to thin and sleek with some wannabe curly ends. Anyways, this is the end result. I (my hairdresser actually) cut my hair so it lightly touches my shoulders. It’s also cut evenly so a maximum of volume is maintained. The charity I’m donating to is Think Pink. This is Belgium’s national breast cancer campaign. My hair will be going to their Beautiful Lengths fund or ‘Geef om Haar fonds’. This fund collects hair from women or men who like me cut at least 20 cm of their hair. They then sell this hair to a company that make wigs. The profits are then used to refund the wigs of women who lost their hair during breast cancer treatment. Due to the high costs of the treatments they are often in financial difficulties and can’t afford a wig of their own. Losing your hair is very hard for a lot of women with cancer. It visibly confronts them with the horrible disease. About 8% of women even refuse to undergo treatment because of the hair loss. In these cases, something as simple as a wig can be crucial. At first, I wasn’t planning on giving my hair to charity. I wasn’t sure if I wanted to cut off as much hair as I did. But after informing myself on the change I could make by cutting off only a few more centimeters, I couldn’t not do it. 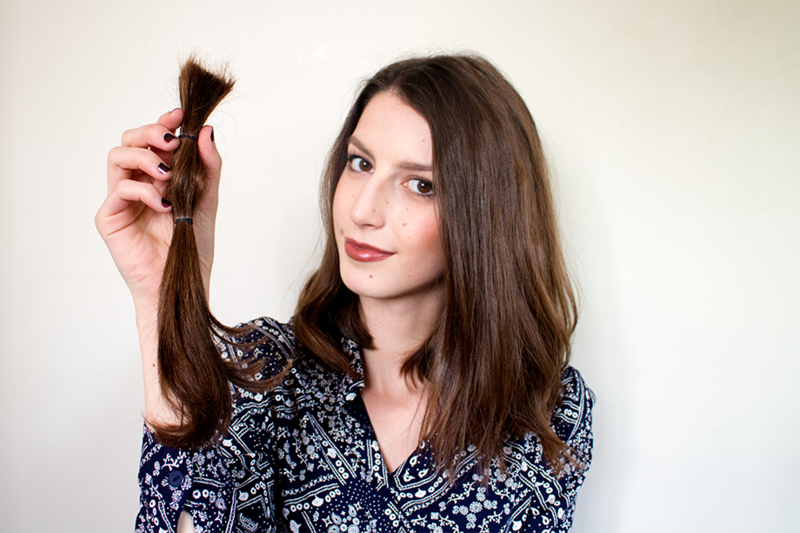 If you are thinking about cutting a significant length off your hair, please inform yourself on donation. You have two choices: let your hair be brushed away into a corner by your hairdresser or putting it into an envelope, send it off to charity and possibly save someone’s life.